Buckskin Horses are not a specific breed, they are horses that have a common color - tan or bronze coloring with black points. A true Buckskin should be the color of tanned deer hide with black points. Shades may vary from yellow to dark gold. Points (mane, tail, and legs) can be dark brown, or black. Ponies and horses showing predominance of draft horse blood are not eligible. Buckskins developed a strong reputation as a sturdy working horse in the frontier of the western United States. They were highly regarded by the cowboys of the old west, Buckskins were used for pack, harness, and saddle. The American Buckskin Registry Association was founded in 1962, it opened its registry to not only the Buckskin, but also Grulla and Dun colored horses. Also included in the colors accepted is Red Dun with varying body shades of red, and the Mouse Dun or Coyote Dun, a slate color resembling a salt-and-pepper coloration. 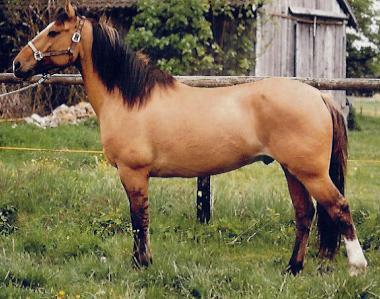 Most Buckskins are of Spanish origin, European pony origin, or of America's Norfolk Trotter origin. This is mainly due to the fact that Dun coloration in these bloodlines was not frowned upon as it was with horses that contained Arab background. Any horse that is registered with the ABRA can also be registered in any other breeding association. It should be noted that the American Buckskin Registry Association has put forth a great effort to put emphasis on the conformation of the horses in its registry. The Buckskin will not enter any horse into its registry that shows signs of below-average conformation, regardless of the desired coloring.